On April 28th, Fr. Seamus Finn, OMI, celebrated Liturgy with a JPIC theme for a group from St. Peter’s Catholic High School in Ottawa, Canada. 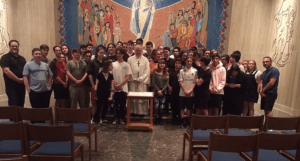 The Mass was celebrated for the students and their chaperones in the Oblate Chapel at the Basilica of the National Shrine in Washington, D.C . A representative from the group thanked Fr. Seamus and said the Mass was one of the highlights of their trip.